There used to be a basic rule for iron shafts – if you're a strong, competitive player you choose steel, and if you're older, slower, a woman, or generally not athletic, you choose graphite. Steel shafts were always known as exceptionally consistent while graphite was unpredictable and overly light and flexible. In truth, many of these generalizations were actually somewhat accurate, as graphite shafts were a work in progress for quite awhile. Today things are significantly different, as materials, designs, and manufacturing techniques have turned graphite shafts into anything but inferior products. In fact, a number of PGA Tour professionals are now using composite shafts in their driving irons, and some, like Brandt Snedeker, Matt Kuchar, and Fred Couples, are playing composite shafts in their standard irons. 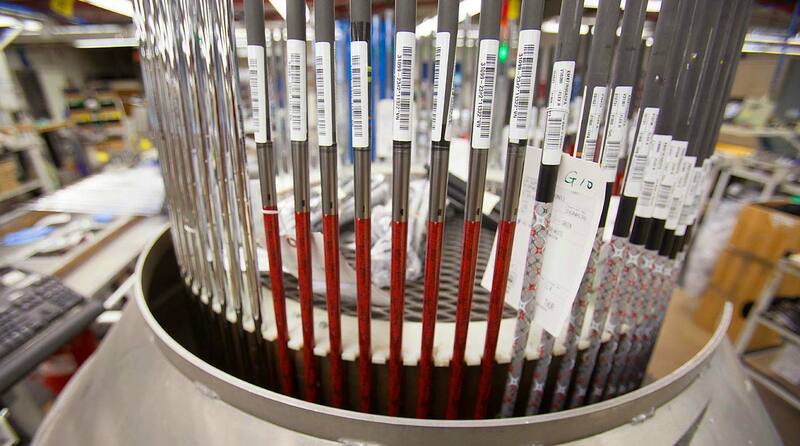 With all the different options, choosing the right iron shafts can be difficult. So how do you know if you should choose steel or graphite? According to Tim Briand of True Spec Golf, approximately 75% of players he fits have the wrong shafts in their irons, the majority of which are too heavy and too stiff. Here are several parameters he recommends as a guideline to help you avoid this common pitfall. Of course, getting fit by a qualified professional is another way: You have an injury or other physical issues: Anyone with injuries to the upper body (wrists, hands, elbows, shoulders, etc.) is a good candidate for a graphite shaft. Steel transmits potentially damaging vibrations much more readily than graphite and also tends to be heavier, which places more strain on the body. If you've had neck or back problems lighter weight graphite can be a big help for you, too. You struggle to hit the ball with ample trajectory or lack clubhead speed: You're a prime candidate for graphite shafts. Steel shafts are now offered in lighter weights than ever before but not as light as graphite and not as varied in the flex profiles available. Steel tends to have very low torque (rotation during the swing) and also a stiffer tip section, while graphite can offer much higher torque rates and more flex in the tip. This combination will help with launch and also help you swing faster with less effort. You prefer a smoother feel: As previously mentioned, steel transmits a lot more vibration to the body, which can contribute to injury. However, those vibrations are also called "feedback," and some players absolutely need that for control of not only distance but also the clubhead itself. Graphite shafts will eliminate many of the detrimental vibrations but also transmit a much more muted feel to the hands, posing a challenge for some players when first making the switch. According to Briand, the most common problem for players making the transition from steel to graphite is getting the feel for the clubhead during the swing. But he also finds that most get used to the new sensation very quickly and almost none go back to steel once they've become accustomed to graphite. Something to consider: Most middle-aged men don't want to admit it, but according to launch monitors around the world, most of us swing with speeds much closer to an LPGA player than a PGA Tour star. And guess what type of shaft is extremely popular in irons on the LPGA Tour? Yup, graphite. So take a hint from the ladies and enjoy the full advantages of technology when possible – your body will thank you and your scores will probably be lower, too.